We’ve taken all the flavor of one of your favorite pies and combined it with our thick, creamy Greek yogurt. The result? 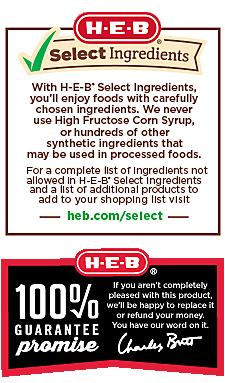 H-E-B Select Ingredients Key Lime Greek Yogurt! Bursting with zesty lime tang, this yogurt can be enjoyed by itself or with unique mix-ins like granola, coconut flakes, fresh berries, and more. Ingredients Strained Yogurt (Cultured Pasteurized Fat Free Milk), Lime Preparation (Water, Sugar, Crystalline Fructose, Lime Pulp, Corn Starch, Lime Juice Concentrate, Vegetable Juice Concentrate [Color], Natural Flavor, Pectin, Turmeric [Color], Calcium Lactate, Lemon Juice Concentrate).